In today's world 'health' means far more than merely the absence of illness. In Rethinking Health Promotion Theodore H. MacDonald sweeps away the confusion surrounding the function and position of health promotion. He argues that, far from being a modern innovation, health promotion has existed as a distinct and separate enterprise for as long as biomedicine and cautions against health promotion becoming organized merely an off-shoot of medical care. 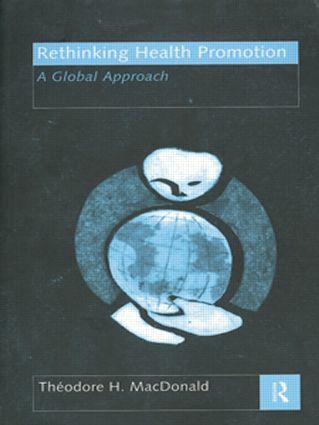 Drawing on the author's experience as a World Health Organisation consultant, the book also tackles the question of whether health promotion has relevance on an international scale or whether it is purely a eurocentric phenomenon. Against this background individual chapters explore universal factors such as sexual health, diet, unemployment, alcohol and tobacco use. With its critical and historical approach this book breaks new ground in assessing health promotion and will be stimulating reading for the wide variety of students and professionals studying health promotion. Theodore H. MacDonald is Professor and Director of Postgraduate Studies in Health at Brunel University. He is a Chartered Psychologist, Fellow of the Royal Society of Medicine and Consultant to the World Health Organisation (Eastern Mediterranean Region).